Calling fellow earthlings and sisters of the stars to join in on a cosmic welcoming. Journey along on the equatorial salute. Travel time and space on this incredible celestial experience. This is a solstice with little portents of spring. Still locked in an arctic seas scape and deep polar freeze witness a sleepy city buried in winter waiting to be reawakened. Behold in all its splendor the blood red solstice full moon heralding this auspicious day as it gracefully sets over the inert and sleepy Adirondack mountains. This majestic scene is followed by a beautiful solstice morning sunrise. 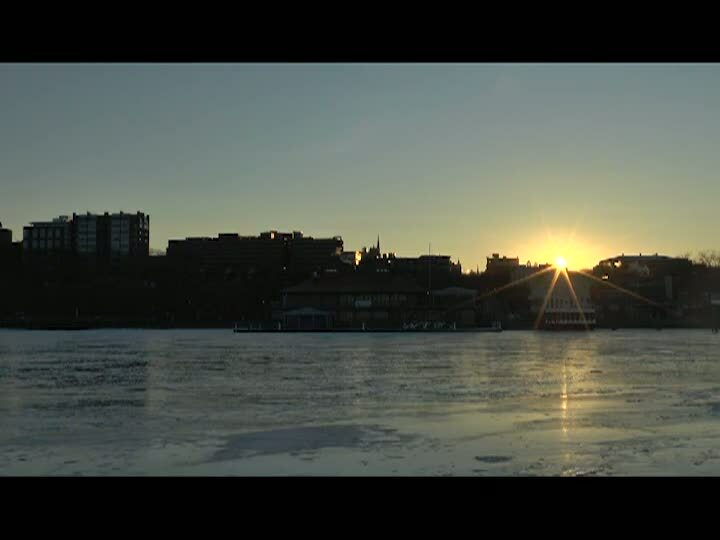 Watch this magical day unfold in all its glory with rare cutaways of historic Burlington Vermont culminating at the stone earth clock with a spectacular solstice sunset. The full solstice moon again bids a sleepy goodnight to a day of portents of a wondrous spring.